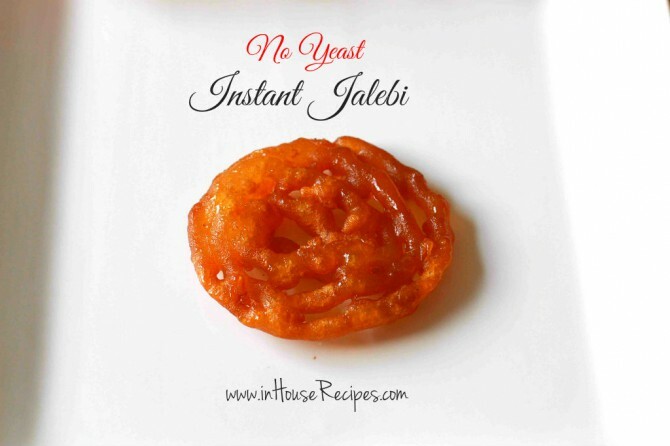 Instant Jalebi no yeast can be made easily with our tried and tested recipe. Check the recipe of Chashni also to make the jalebi juicy and crunchy. 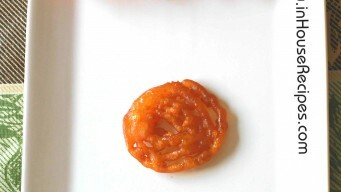 Crispy and juicy Jalebi can be made easily at home. The only caveat is that you have to bring in your drawing skills on the jalebi shape and if you are a new-comer in frying Jalebi's, you might discover some really new shapes and sizes . 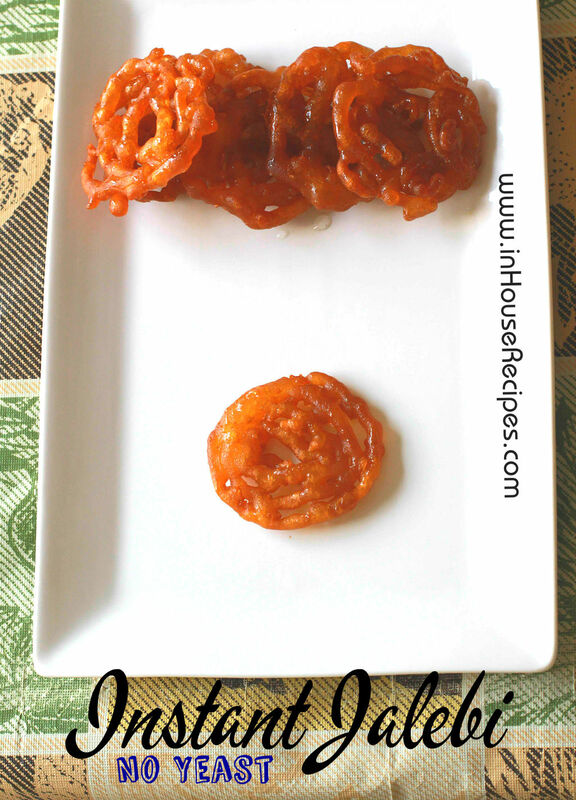 This recipe is a result of the eagerness to eat Jalebi even when we had no Yeast available in the Kitchen. On Maahi's earlier stints, she has been comfortable sprucing up the Jalebi batter with this important ingredient. But, today a new recipe has emerged out of the necessity and it definitely is a candidate for sharing here. Jalebi came out super delicious and crispy. Add refined-Flour Maida, Soda-B-Carb, Corn-Flour, Curd, 1 Tbsp Oil, Baking Powder in a pan and mix well. Try to remove the lumps as much as possible. We need to make a smooth batter and therefore need to add small quantity start with like 1/4 cup of water gradually and keep mixing. Once you see the smooth paste coming up, add 1 Tbsp of Oil and keep mixing it. Smooth batter is ready. We have used total of 3/4 Cup water for this paste. Lets keep this batter aside for about 10 minutes. In the mean time, we can prepare the Sugar syrup. Take a pan and add Sugar along with 2 Cup of Water. If you want to add some aroma to Sugar syrup, you can add Cardamom powder. We are adding 1/2 tsp Cardamom. This is optional though. Let it cook on high flame for a minute and then turn the stove on medium flame. The sugar will dissolve itself within 1 minute and then it should be cooked until it achieves 1 string consistency. Sugar syrup is on its way and on the other side, we can keep Oil for heating-up in another pan. The Jalebi frying pan should be flat from bottom with small depth. Add the Oil to pan and let it heat-up on high flame. Once Sugar syrup gets ready i.e. achieves 1 string consistency, turn the stove on low flame. To measure 1 string: Take small amount of syrup in a spoon and use your index finger and thumb to pick a drop. You would see a string developing between the index finger and thumb. If you see 1 string, the Sugar syrup is ready else it would need another 1-2 minute on stove. If the Sugar syrup is ready, turn the stove on low flame. This will help keep the sugar syrup hot till we dip Jalebi in it. This is not essential but is recommended. You can use a zip lock bag or a milk bag to fill Jalebi batter or the small bottles which look like tomato ketchup dispensing bottles also called Jalebi maker bottles. We have filled a small bottle You can also use a ketchup dispenser to dispense Jalebi Batter. If you are using a zip lock bag or a milk bag, make a 5 mm cut on one of its corners. We recommend using the bottle as the milk bag or zip lock bag are not considered safe. It has happened with us that the bag burst in the middle of dispensing right on top of the hot Oil. So, it is better to be safe while frying. Roll your hand slowly and dispense the Jalebi batter in hot oil. It would be a bit difficult to make any specific design in the first go. You will learn it with experience. Try to roll your hand in a way that a circle is completed and then keep adding more circles around the primary circle. Let it fry until it turns golden brown from both sides. Remember that you would need to flip it too. Take out the ones which have turned golden brown from both sides and dip in Sugar syrup. Make sure that you dip the Jalebi completely in Sugar syrup to absorb as much as it can. You can use a spatula or a spoon to keep it sub-merged. After 2-3 minutes, take out the Jalebi from Sugar Syrup. It is now ready to serve hot. You can garnish Jalebi with Pistachio and Saffron if you want before serving. The Jalebi can refrigerated for up-to 2-3 days. re-heat Jalebi using a Microwave again before consumption. Do NOT re-fry it to re-heat.